Imaging needs are rapidly growing and changing. One software user may need an entry-level image capture and enhancement solution, while another may need a more robust package that offers customizable macros and application-specific plug-in modules. This is why Media Cybernetics has developed the Image-Pro Family software series. 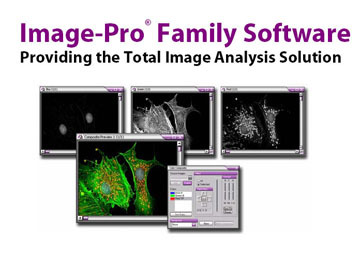 Based on the Image-Pro platform already used daily by thousands of researchers and engineers, the Image-Pro Family offers three unique Image-Pro packages to accommodate a variety of imaging needs. Perfect for basic imaging or for image capture stations, Image-Pro Express offers numerous capture and enhancement options. More advanced than Image- Pro Express, Image-Pro Discovery includes added measurement and analysis capabilities. The ultimate imaging software package, Image-Pro Plus includes all of the functionality of Image-Pro Discovery along with added analysis tools and the ability to write customized macros and plug-ins. • Image composition including stitching, tiling, rotation, multicolor and etc.